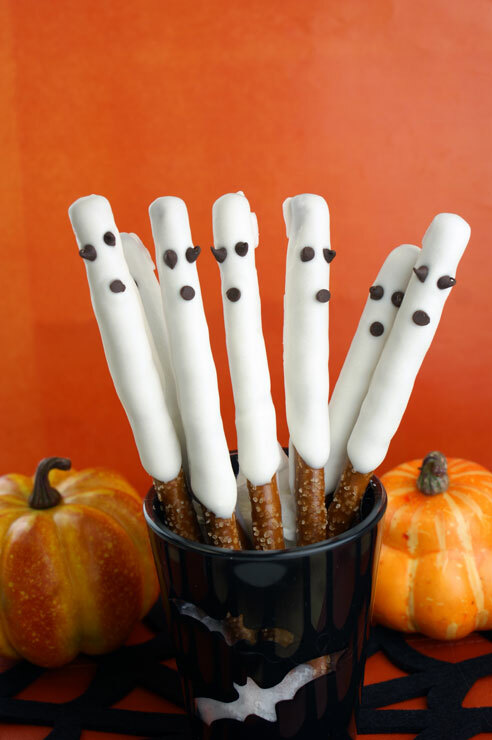 Three ingredient ghost pretzels; the perfect salty-sweet treat for Halloween! 1. Melt Vanilla CANDIQUIK® in Melt & Make™ Microwaveable Tray according to package directions. 2. Dip half of each pretzel rod in the melted CANDIQUIK®; allow excess coating to drip off and place on wax paper. 3. Before coating has set, place two mini chocolate chips on as the eyes. For the mouth, cut off the tip of a mini chocolate chip and place on the pretzel with the bottom side facing up.